Medical Qigong (“chee-gong”) balances the energy flow (chi) throughout the body by realigning the natural circulation of chi throughout the body’s channels. The practitioner is able to feel “unbalanced energy” and realign the flow of energy, removing blockages and toxins from the patient. This process can also provide energy to deficient organs or meridians, bringing the whole body back to its highest functioning state. Qi (pronounced “chee”) means air, breath of life, or vital energy that flows through all things in the universe. Gong (pronounced “gung”) means the skill of working with or cultivating self-discipline and achievement. Together, Qigong means the skill of cultivating vital energy, or the ability to work with the electromagnetic energy of the body. 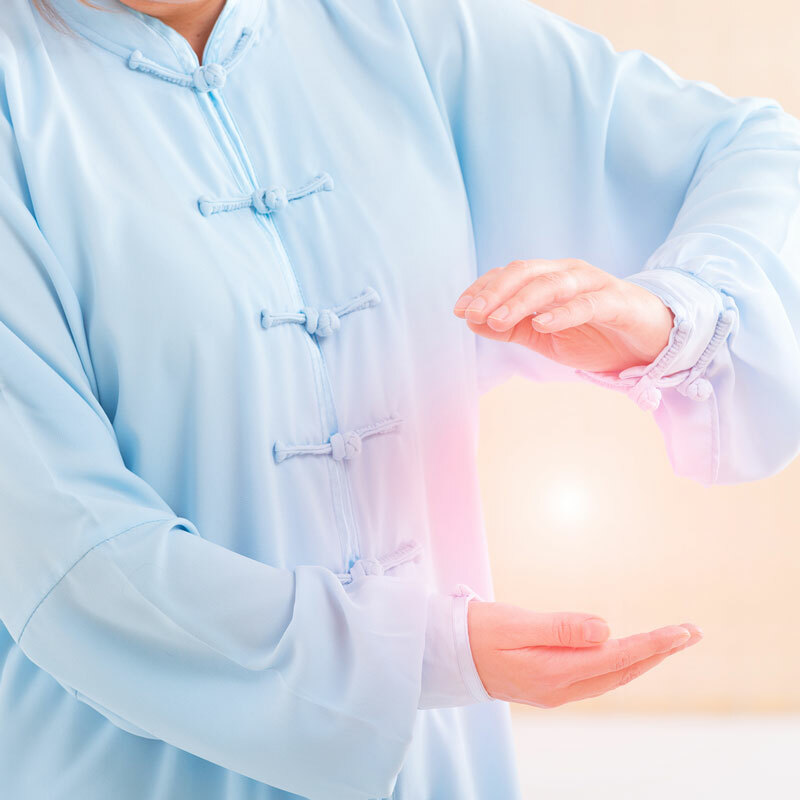 Medical Qigong is an ancient form of Chinese energetic medicine, and is one of the five branches of Traditional Chinese Medicine (TCM), along with acupuncture, herbal medicine, nutrition, and medical massage. Qigong is a mind-body practice that improves one’s mental and physical health by integrating postures, movement, breathing techniques, and focused intention. Medical Qigong balances the energy flow (Chi) throughout the body, realigning the electromagnetic energy which surrounds and pervades all the body’s channels in living creatures. This healing modality is a complete system of health care that recognizes the root causes of symptoms or disease, and treats the client as a whole. It may successfully treat conditions which Western medicine finds resistant or ambiguous. The goal of Medical Qigong is to correct bio-energetic imbalances and blockages. The practitioner is able to feel these “unbalanced energies” in order to realign the flow of energy and remove blockages and toxins from the patient. This process can also provide energy to deficient visceral or meridians, strengthen the body, regulate the internal organs as well as the nervous and the immune system, relieve pain, regulate hormones, and release deep-seated emotions. After the treatment is completed the patient may be given Medical Qigong prescriptions to assist in their ongoing healing. These prescriptions exercise are specifically designed to the patients’ needs using physical movement, breathing methods and mental intention to correct and restore the function in the body. Dr. T. Sundar Sanchez wrote his doctoral thesis in “The Effects of Medical Qigong Therapy in the Healing Recovery of Athletic Sports Injuries” at the San Jose State University Athletic Center. The discoveries described are that Medical Qigong Therapy can be justified by the results and by the satisfaction of injured athletic participants. The findings showed significant improvements of their injuries, as well as a noticeable decrease in pain, and an overall increase in feelings of well being. Recovery time may also be considerably shortened with the aid of Medical Qigong Therapy. Whether you have acute pain or have been to the doctor with inconclusive lab results, yet know that something isn’t right, Help U Heal Healing Arts gets to the root of your issue for lasting relief. Schedule an Appointment with Sundar Today! © 2019, Sundar Sanchez. All Rights Reserved. Website design by Brooktown Design.